Pali Kai Studio C Kauai vacation rental is located oceanfront on a bluff above Kalapaki Bay and the spectacular Kauai Marriott Hotel grounds; just minutes from Lihue airport & Lihue town. Relax at the Kauai Marriott Hotel pool and fitness center. Pali Kai Studio B Kauai vacation rental is located oceanfront on a bluff above Kalapaki Bay and the spectacular Kauai Marriott Hotel grounds; just minutes from Lihue airport & Lihue town. Ocean View, 1 Bedroom, 1 Bath, New ground floor unit with a full kitchen, NEW KING bed, sofa sleeper, complimentary WiFi and parking, steps to sandy beaches. Relax to the sound of the ocean from your private lanai on this Beachfront Resort! Sleeps 4. Ocean View, 1 Bedroom, 1.5 Bath, 3rd floor, end unit with a full kitchen, complimentary WiFi and parking. Steps to sandy beaches. Relax to the sound of the ocean from your private lanai! King bed and queen sofa sleeper. Sleeps 4. Oceanfront, 1 Bedroom, 1.5 Bath, ground floor unit, full kitchen, complimentary wifi and parking. Relax to the sound of the ocean from your private lanai on this Beachfront Resort. Steps to sandy beaches. Cal King bed & sofa sleeper. Sleeps 4. Oceanfront, 1 Bedroom, 1 Bath, ground floor unit with full kitchen, complimentary WiFi and parking. Steps to sandy beaches. Relax to the sound of the ocean from your private lanai. New Cal King bed & sofa sleeper. Two TV's. Sleeps up to 4. Oceanfront, 1 Bedroom 1.5 Bath, 3rd floor unit with a full kitchen, complimentary WiFi and parking. Steps to sandy beaches. Relax to the sound of the ocean from your private lanai on this Beachfront Resort. King Bed and day bed. Sleeps 3. Pali Kai Cottage 17A Kauai vacation rental is located oceanfront on a bluff above Kalapaki Bay and the spectacular Kauai Marriott Hotel grounds; just minutes from Lihue airport & Lihue town. Relax at the Kauai Marriott Hotel pool and fitness center. Ocean View, 1 Bedroom, 1.5 Bath, ground floor, end unit, queen bed and queen sofa sleeper, full kitchen, complimentary wifi and parking, steps to sandy beaches. 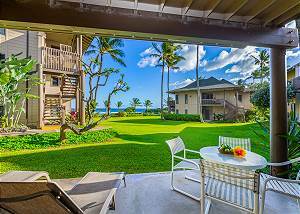 Sleeps 4.
kaha lani resort #206, ocean view, steps to the beach, free wifi & parking! Ocean View, 1 Bedroom, 1.5 Bath, 2nd floor end unit with kitchen, complimentary WiFi and parking. Steps to sandy beaches. Relax to the sound of the ocean from your private lanai on this Beachfront Resort! King bed & sofa sleeper. Sleeps 4.